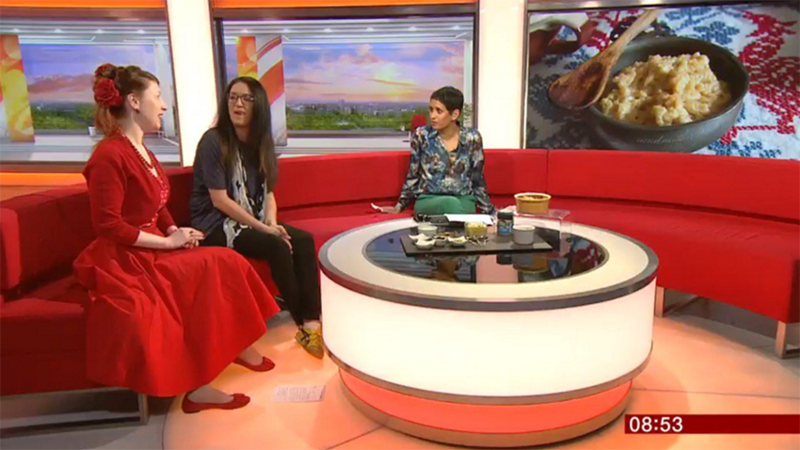 Yesterday, 11 april, I was asked to come on the BBC One Breakfast television program to talk about the history of rice pudding in light of the sudden craze for rice pudding – and that I have just written Pride and Pudding, a whole book about pudding. So how has rice pudding got itself back on our menu’s and in our hearts? Rice pudding now as its own restaurant in Manhattan, New York dedicated to rice pudding – called ‘Rice to Riches’. The BBC journalist contacting me told me that Waitrose executive chef, Jonathan Moore, said that after visiting Manhattan’s rice pudding-only shop recently, Jason Atherton’s Michelan star restaurant, Pollen Street Social, and Berner’s Tavern in London have both re-invented the classic dessert. He also said sweet, savoury and embellished versions are becoming more ‘extreme’, with options at The Rice Cream Shoppe in Greenwich Village including gluten free and vegan versions. Waitrose also reported that sales of rice pudding have risen by 8% year on year. I’m sure that in this modern day and age with dishes that look like works of art, we are all craving for something real and honest. Something which just isn’t pretending to be more than it is. Something so humble it conjures up memories of your nan, your mum or the auntie who made it especially when you were visiting. I have faint memories of my mum making rice pudding and I can remember the impatience for it to cool off and develop that glorious yellow skin which was really, the best part of the pud. Rice pudding is also easy to make, and not at all very unhealthy if you don’t drop in half a ton of sugar. Jackie Kearney – Masterchef finalist – was also on the show with me and she brought in some puddings for us to try. A delicious vegan one (check out her book Vegan Street Food btw) with spices which I wanted to finish there and then – only I was on live TV so had to politely give it back!! Then one with passion fruit and a traditional baked one with a big skin which just made Jon Kay, the presenter cringe. He does not like a skin on a pudding, he does not know what is good I say! But has rice pudding always been a humble dish, a pudding for all, a dish so plain we nearly forgot about it? Rice pudding started its life in the kitchens of Kings and Queens. Rice was an expensive import so it would have been only for the elite. The first ones were pottages, which you can more link to a side dish or something more like a risotto than a dessert pudding (see what I did there, ‘dessert pudding’, cos not all puddings are sweet!!!) like we know it today. The Forme of Cury (1390) – the earliest surviving collection of recipes in England – gives a recipe for a rice pottage, and one for Ryse of Flesh. The Rice of Flesh is savoury and made with broth, almond milk and saffron, while the rice pottage is what would become the modern-day rice pudding and the recipe just omits the salt and broth, using water instead to cook the rice the first time. 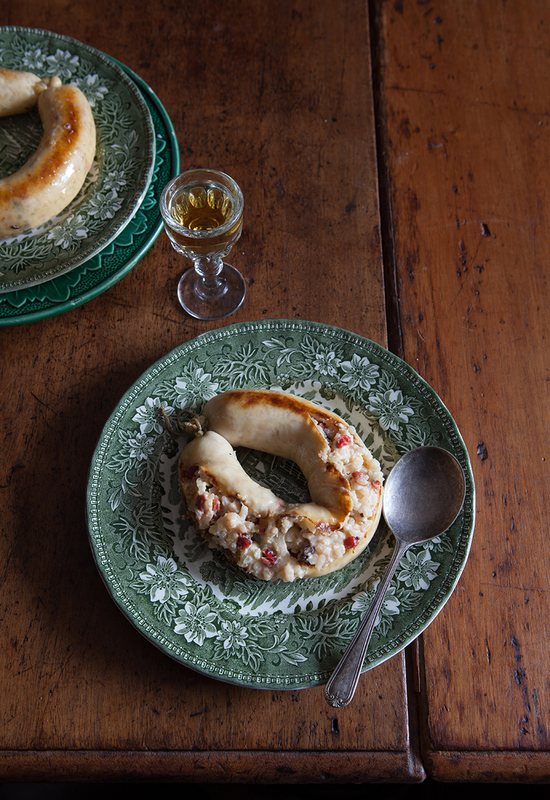 Sugar isn’t added in The Forme of Cury; for a sweetened rice pudding we have to wait until the 15th-century Austin manuscripts, which include a pudding sweetened with honey and sugar. John Murell (A Newe Booke of Cookery) in 1615 adds eggs, suet, currants, cinnamon, sugar and barberries and stuffs the rice pudding into sausage skins, like a white pudding. In 1660, Robert May (The Accomplisht Cook) adds eggs, beef suet, salt, nutmeg, cloves, mace, currants, dates and powdered coriander seeds. 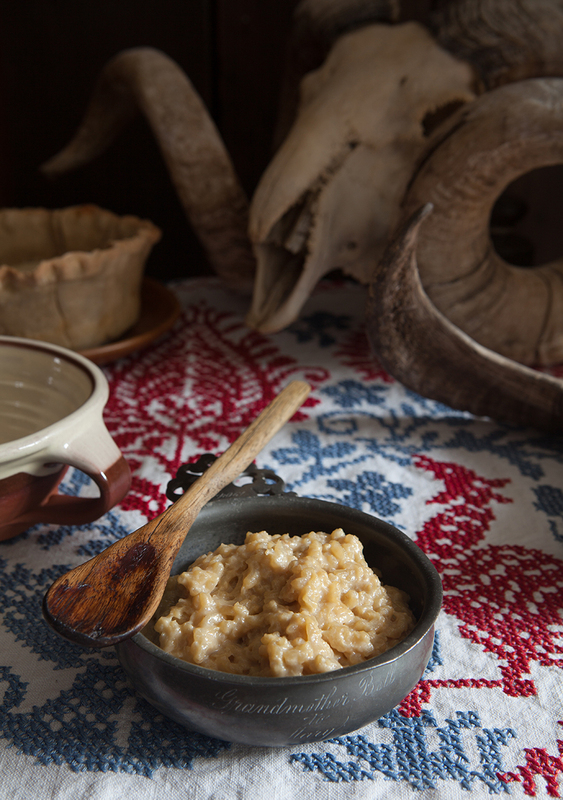 Unlike a modern rice pudding, these recipes uses suet as in most boiled puddings. 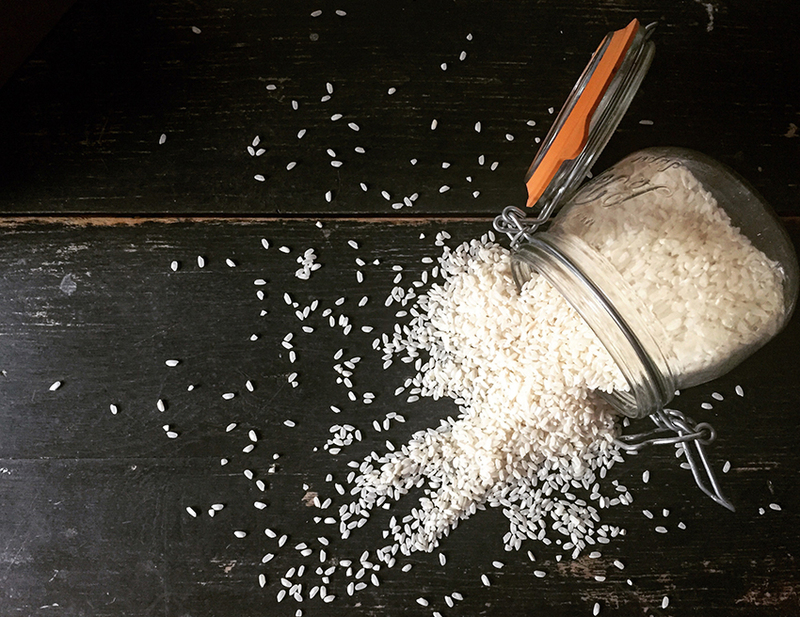 As we can use arborio or pudding rice today, we don’t need to steep the rice overnight. I find arborio rice has a better result if you’re going to stuff the pudding into sausage skins. If you are making this as a regular rice pudding without using sausage skins, you may use pudding rice, and use a knob of butter instead of the suet. 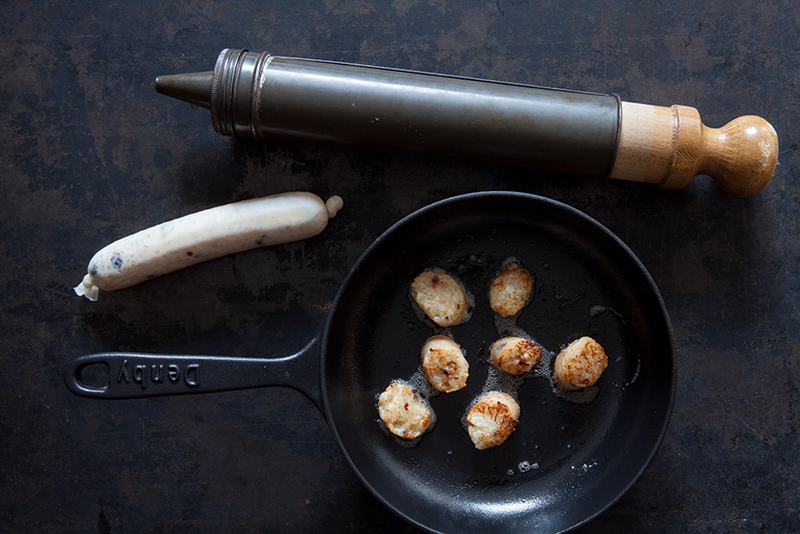 When made in sausage skins the puddings were usually roasted or fried before serving which really is very good. Also, I think it’s a laugh to serve people their dessert pudding in a sausage shape. It’s only when in the beginning of the 18th century, import of rice becomes more common, that rice pudding becomes something which is more every day rather than posh. By 1747 Hannah Glasse has several recipes for it in her book – mostly ‘borrowed’ from other cookery writers of that time. And in the 19th century Mrs Beeton tells us it is economical, good for the nursery and Eliza Acton tells us it is cheap. In the 20th century it is so cheap and easy that it becomes a staple in schools and hospitals, and we start to really think rice pudding is awfully plain. Dorothy Hartley writes in Food in England (1954) that “East End women make a rice pudding using broth … when cooked it is finished under the joint of Mutton.” This is very similar to the “Ryse of Flesh” recipe found in The Forme of Cury (1390). Today we want to go back to those easy straightforward dishes. As a hankering for the past, your childhood, and the safe and warm feeling that (hopefully) comes with it. We can add so many things to rice pudding, you can jazz it up with spices, add fruit and nuts, but it will always stay a rice pudding. Think of it as an old friend, even with a new coat and tie, it will always be that same old friend you’re happy to see. Take Ryse and waishe hem clene. And do hem in erthen pot with gode broth and lat hem seeþ wel. Afterward take Almaund mylke and do þer to. And colour it wiþ safroun an salt, an messe forth. Put the rice and broth in a deep saucepan and heat gently. Stir well and bring to the boil. Simmer and stir often so the rice doesn’t stick to the bottom of the pan. When the liquid is almost completely absorbed, after about 15 minutes, add the almond milk and saffron. Stir well, then simmer gently for 20-30 minutes, stirring every now and then until all the liquid is absorbed and the rice is cooked and thick. Spoon the cooked rice pudding into a serving dish. Growing up in England rice pudding was always a staple and to this day I regularly eat it(particularly for breakfast). I own a cafe in Brisbane where we make a few bits and pieces that people can take home and enjoy there. One of our best sellers is simple rice pudding with stewed fruit. For some people it’s a memory of their childhood and for others it’s a completely new discovery. It amazes me that we sell so much of it given that it’s so easy to make at home, but I think for a lot of people they loose themselves in that bowl of rice pudding and life become simpler, even for just a few minutes. Good to hear rice pudding is so popular on your menu! And I like what you’re saying and agree “but I think for a lot of people they loose themselves in that bowl of rice pudding and life become simpler, even for just a few minutes.” Beautifully put and thanks for sharing that! Congrats on the new book! The first English rice pudding I had was in boarding school where they served up a watery mess. You had to add a lot of jam to make it palatable. It was not something that you would crave. Since then, I have come across so many better ones in London restaurants and have come to love it again. my grandmother made us rice pudding frequently. Rice, sugar milk and cinnamon cooked on a stove until it was creamy. I still make it as an adult. it is the best thing ever. My family has a English decent my grandmother also ate it as a child.